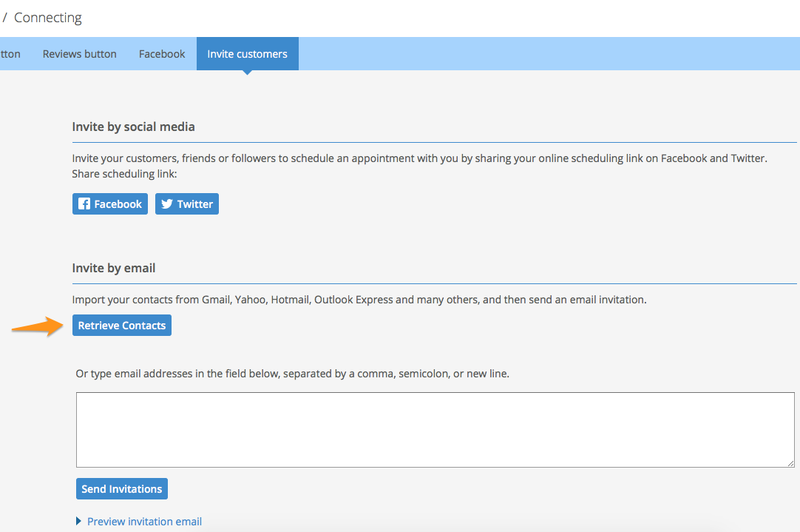 Genbook’s Customer Invitation Tool makes inviting your clients to make their appointments online quick and easy. Go to your Settings tab and click on the “Invite clients” link at the bottom (under the Connecting heading). On the following page, you'll see the option to invite clients in a few different ways, including via Facebook and Twitter. You can also invite them via an email that we send to them automatically. 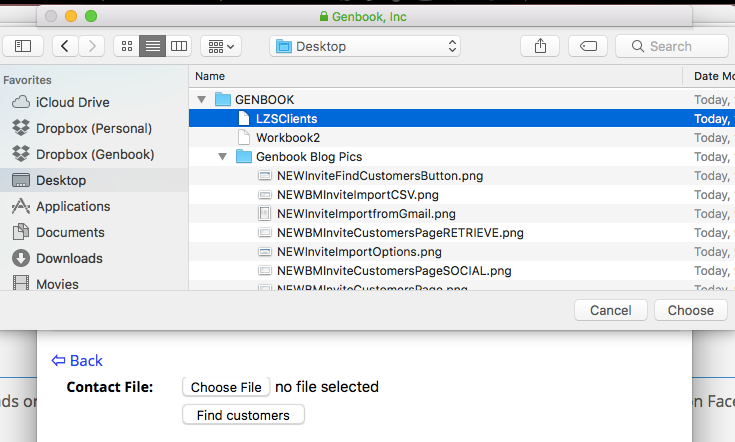 Whether you have your client list in a file on your computer, or you want to import contacts from an email account, Genbook has you covered. To import clients, first click “Retrieve Contacts”. You'll then see all the import options we offer. Once logged into that account, you'll be able to choose the clients to whom you wish to send the invite. Don't forget to hit the "Next" button at the bottom. If you'd like to import a CSV file from your computer, click the "CSV" icon that initial CloudSponge-powered screen you see. Pro tip: Make sure the first three columns of the document are labeled and represent your clients's info in the following way: First Name, Last Name and Email Address. When presented with the option, click the "Choose file" button, select the file you're importing, then click "Choose" at the bottom right (the way it looks on your computer may vary based on the operating system and programs you use, so don't worry if it doesn't look exactly like our screenshot below). 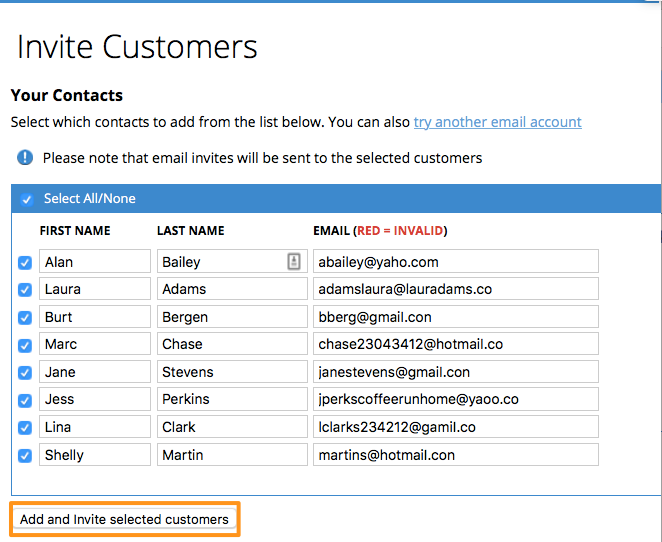 Once the file itself shows up on that Invite Customers page, click "Find Customers" to pull up the list and choose which of contacts should be sent invites. Next, select which of your contacts you wish to add to the invite list, and click the "Add and Invite..." button at the bottom left. On the final page, you’ll see the email addresses of all the people you successfully invited to book online with your business. 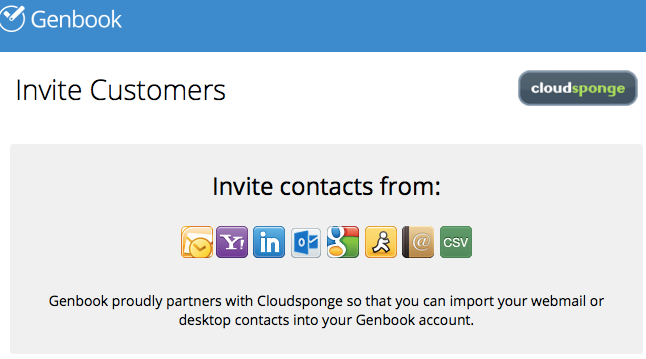 All of these contacts are also automatically added to your Customer Database (found in the Customers tab). You'll then see confirmation of how many invites were sent. 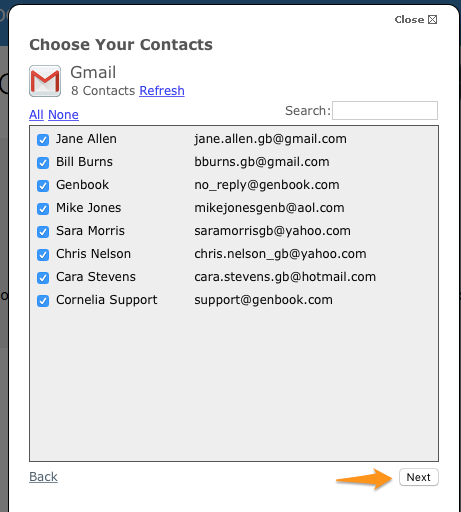 You can also invite just one or two contacts by entering their emails in the large field below the Retrieve button. Once the emails are sent, you'll receive confirmation.